Join Starlight Bingo for a truly out of this world experience! There's an amazing Welcome Bonus waiting just for you. Receive £15 absolutely FREE just for signing up! And then, when you make your first deposit of just £10, you will be rewarded with £35 FREE – that's £45 to play with right from the start! Subsequently, you will receive a 250% bonus on your second deposit and a mega 300% bonus on your third. There are loads of top bingo and slot games to choose from, mobile play, hot promos and more! There are loads of games to choose from at Starlight Bingo that will keep you having fun and winning big 24 hours a day, 7 days a week! There are 16 bingo rooms, with a huge selection of 75, 80 and 90 ball bingo games, as well as newer games like Speed Bingo. You can buy bingo tickets for as little as 1p, but for the bigger prizes, buy cards for up to 50p – which you won't regret when you're hitting those mega jackpots! There are also 34 of the most popular slot games just for you. Enjoy Queen of Legends, Honey Bees, Mystic Wilds and more. All you have to do is spin to win! If all that isn't enough, you can also play casino games such as Blackjack, Roulette and Keno, and Scratch Cards for even more chances to win! 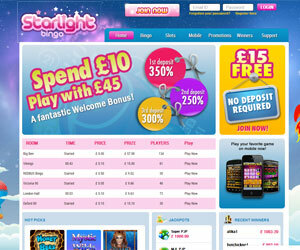 Starlight Bingo promises loads of incredible promotions! Enjoy Happy Hours 8 hours per day! All you have to do is deposit during those hours and Live Help will send you your freebies. As well, every time you play bingo and slot games, you can earn 20% Cashback every week! Invite your friends to join in on the Starlight Bingo fun and get £10 worth of Amazon vouchers. All you have to do is refer your friends, and when they make their first deposit, you will get your FREE voucher. Starlight Bingo also has some mega jackpot prizes! There are daily, weekly and monthly guaranteed jackpots, where you can win up to £1,000! These are just a few of the amazing promotions waiting for you at Starlight Bingo. Never miss a win at Starlight Bingo! Play top bingo and slots anytime, anywhere! There's a huge selection that you can take with you on the go, such as Rubies and Sapphires, Treasures in Egypt, Blackjack, Roulette and more!